Doom II: Hell on Earth is the 1994 sequel to the popular Doom first-person shooter, developed by id Software. The game is considered as successful, if not more so, than the original, adding in many new enemies and challenges to face. 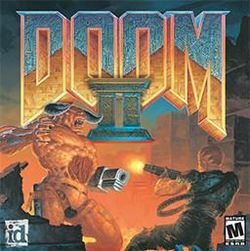 Doom II begins where Doom left off, after Hell had begun invading Earth, and tells the story of the mysterious marine's battle to free Earth from the clutches of the demons. This page was last edited on 9 July 2016, at 03:46.